Despite the advancements in our understanding of the role strength training plays in our development as long distance runners, there are still some pervasive myths in the running community about the best way to approach improving running-specific strength. Like most long-standing myths, the misunderstandings about strength training come from outdated information that has been passed down throughout the years. Unfortunately, in today’s world where anyone can become a running coach by attending a weekend seminar, and message boards in forums contribute to the spread of misinformation; many runners simply repeat the information they’ve “learned” without regard for recent findings, research and developments in the sport. Luckily, in this article I am going to dispel some of these myths and hopefully start reshaping how all runners view and incorporate strength training into their running schedules. When most runners hit the gym, they feel like they need to replicate the feeling and the work they do on the roads. Typically, that means keeping the heart rate elevated. As a runner myself, I know it can feel foreign to consider a workout effective if I’m not breathing hard. That means most runners try to take as little rest as possible between sets. It’s not uncommon to find runners resting only 30-60 seconds between exercises. Unfortunately, these brief rest periods are detrimental to strength development because of the primary energy system used and the rate of recovery. Unlike in running, which relies on the aerobic system for energy, the major source of energy when trying to build strength is what we call adenosine triphosphate phospho-creatine (ATP-PC). ATP-PC is responsible for providing the energy to produce short, powerful movements – like we need for strength training. As you can see for this chart below, ATP-PC requires at least two to three minutes to approach full recovery. While it will feel completely foreign to you as a distance runner, it’s important that you take the necessary recovery time between each set to fully replenish your ATP system. By not fully recovering between sets when strength training, you’re not able to maximize the recruitment of your muscle fibers and the quality and effectiveness of your session plummets. If your goal is to build strength, you need to be taking at least a 2 minute recovery between each set. It’s often claimed (since distance running is endurance oriented) that the use of high reps with low weight is the best way to build endurance to running-specific muscles. The thought process is that high repetitions, just like higher mileage, will improve muscular endurance. That’s why you often see runners lifting the 5-10lb dumbbells for shoulder raises or even in the running-man motion (don’t worry if this is you, I used to do lots of this myself). First, recent research has shown that performing repetitions in the 12-20 range does not increase muscular endurance any more than the 6-8 repetition range. Second, you’re already working on your muscular endurance when out on the road and when doing track workouts. The purpose of strength work is to build strength so performing routines and rep ranges that target this goal is ideal. Therefore, rather than using light weight and high repetition, you should lift the maximum weight you can safely handle for 6-10 repetitions. The 6-10 rep range allows for maximum muscle overload and will recruit the greatest number of muscle fibers, thus leading to increased strength. The next time you head to the gym for your strength training session, consider reducing your repetitions and adding more weight to your exercise. You’ll maximize your strength gains much faster this way. When I first suggest to runners that they will be better served by lifting heavy weights, their initial reaction is, “I want to look like Mo Farah, not Arnold Schwarzenegger”. But, this fear comes from a misunderstanding of how “bulking up” actually occurs. Muscle bulk is not determined by lifting heavy weights alone. In fact, lifting heavy weights is the least important part of the equation. Moreover, because the amount of time you will spend running will vastly outnumber the amount of time you spend lifting heavy weights, it will be virtually impossible for you to gain unwanted or detrimental mass (unless of course you’re seriously overeating, which is not a training problem). Don’t be afraid of looking like a body builder if you’re including heavy lifting in your running routine. It just won’t happen. Likewise, lifting lighter weights with more repetitions won’t make your muscles look more “tone”. The common belief is that high reps magically get rid of fat. While high reps with light weight to fatigue can create a muscular response, it does not necessarily remove fat better than low reps with heavy weight. The mythical “tone” is a result of not losing muscle mass in conjunction with losing weight. As an example, one study from the University of Alabama in Birmingham showed that dieters who lifted heavy weights lost the same amount of weight as dieters who did just cardio, but all the weight lost by the weight lifters was fat while the cardio subjects lost a lot of muscle along with some fat. Runner’s typically think of strength training as an add-on to their running training, rather than an integrated piece of the training puzzle. When you do your strength workouts is just as important as what strength workouts you perform. The mistake many runners make is performing their strength workouts on their easy, recovery or off days. The thinking behind this idea makes sense – you’re the most tired after hard workouts, so why push yourself even more by adding strength work on these days? But, we’re forgetting about the recovery aspect and the training plan as a whole. If you were to perform harder strength workouts, especially anything that involves the lower body, on your easy running day the added stress and shortened total recovery time between workouts would detract from your body’s recovery ability. Moreover, if you perform your harder strength training the day before your workouts, you’ll likely be too tired or sore to perform optimally in the most important session – the run the next day. This is why your hardest strength training days should be on your running workout days. The next time you’re in your gym, take a look around and count the number of strength training machines you see. I’m willing to bet it’s an extraordinarily high number. Because the machines are so pervasive, it’s easy to think that they are just as good, if not better, than free weight and bodyweight exercises. However, in most cases they are far less effective – and in some cases useless. The problem with machines is that they have a limited range of motion, isolate the wrong muscle groups, and don’t trigger the same “supporting” muscle groups response that make some exercises most useful. As an example, we know that hip strength, or lack thereof, is one of the main contributors to running injuries. The prescription is obviously to strengthen the muscles in the hip, which include the abductors. Seemingly, the abductor machine at the gym make this very easy to do. Just sit down, push out and you’re on your way to injury-free running. Research has shown that to improve running-specific hip strength, an exercise should maximize the recruitment of the gluteus medius and gluteus maximus, while minimizing the recruitment of the TFL (tensor fasciae latae – a muscle located on the upper lateral portion of your thigh). The abductor machine actually targets the TFL and therefore has limited effectiveness. Furthermore, a tense TFL, because it connects directly to the knee’s lateral side via the iliotibial band, may increase knee strain that could develop into IT band syndrome. In this case the adductor machine is not only useless, it could be harmful. For an in-depth look at 2 other most blatant examples of this, you can check out my guest post on the healthynomics blog on this topic. By sticking to the right bodyweight, free weight and theraband exercises you can maximize the time you spend in the gym and avoid many of the common pitfalls. Consider how these 5 common myths play into your current perception and approach to strength training. Hopefully, you’ve been reading enough of the current literature, much of which we’ve posted before, to have already made positive changes to your strength training routine. If you need help developing and implementing a full strength training routine to decrease injury and improve performance, check out our Strength Training for Runners Program. It’s a step-by-step guide for exactly when and how to add strength training to your running routine.Click Here to Get Yours Now! Regardless, use the information we’ve presented to dispel these myths to make the most of your time spent in the gym. This is incredibly helpful. I’ve just started to seriously incorporate strength into my training program and have been confused about the best approach, and definitely had been falling for most of these myths. Thanks! Strength training in the gym is only about building muscle strength. For a runner, gym strength training needs to be about building joints, tendons ligaments, bones, not as much about muscles. Muscles goes at twice the speed of other tissues. This is do to blood flow. As a runner injury prevention is key to continued training. So strengthening these area is key to continuing training through out the year. I agree with all 5 myths, plus Velocyclings’ #6. Strength training is key component for almost all runners (there are some exceptions). However each runner is a unique puzzle so specificity, progression, variation, periodization together with absolute customization are required. Whoever gets to adopt all this while keeping it simple and fun wins most races. Thanks for sharing you story, Mindy! This is always super helpful when trying to breakdown myths. They become so entrenched in our beliefs that it takes a bunch of learning and examples like this to really have it sink it. Happy, injury-free running! Excellent article and a perfect example of why you are an awesome coach. Clear and concise, providing research literature to make the case. Great article. I have been following the routines and strength prescriptions in Jeff’s program off and on for some time but I do have the problem that I can’t run and get to the gym for my heavy weights on the same day – rest kids and work get in the way. This really means I’m dropping a rest day I guess. I think that you are right and all of these lifting strategies are myths. Can you supply more sources that explain that high reps don’t build endurance (in reference to myth #2) though? I have a coach that believes that we should be doing 100 squats as a weight lifting work out for endurance and I want to clear things up with him. Thank you! Hi Ben, it would be best to discuss it with him if he has some specific recommendations. 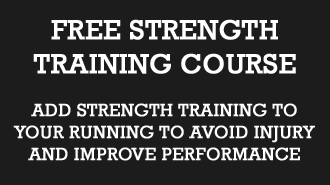 We have a strength training program which is very successful with runners, we would love for you to try that, but it may conflict with what your coach says. We have another article on the benefits of strength training, that has some suggestions for exercises to do that you can show him https://runnersconnect.net/running-training-articles/benefits-of-strength-training-for-runners/ Hopefully this helps!